Are Racetech seats made in China or somewhere else? Somewhere else! All Racetech seats are proudly manufactured in Wellington, New Zealand using a combination of materials sourced locally and abroad. Our small, dedicated team take immense pride in crafting each seat and we celebrate each championship win like we were driving the car. What is back-mounting and why is it required on some of your seat models? We strongly believe back-mounting a seat improves driver safety in an impact and increases driver ‘feel’ of the vehicle. It is no surprise that this same philosophy is now prevalent in international touring car categories such as V8 Supercars and NASCAR. This video explains the concept further. When the Racetech 119 and 129 series seats are crash-tested by the FIA, they are mounted with both back-mount and floor-mount brackets. It is therefore mandatory that these seats are installed using back-mount brackets to achieve FIA homologation. What is the difference between the FIA 8855-1999 (old) and FIA 8862-2009 (new) seat standards? It is difficult to compare the two standards accurately except to say that the newer 8862 standard is much more rigorous and simulates an impact of approximately 70G. The other point to note is that seats meeting the new FIA standard are required to use stiff, energy absorbing foam in the head, shoulder and pelvis areas, improving safety for the occupant. The threaded bosses in my 009 series seat do not line up with all of the holes in the mounting brackets. Is this a defect? No, this is not a defect. The 009 series seats are designed with four threaded mounting points per side in order to allow smaller (10mm rather than 20mm) incremental changes to seat mounting height and angle. In a typical installation, you would only use two mounting points on each side of the seat. I have an old Racetech seat, can I get it re-homologated? No, we don’t re-homologate seats. What is the recommended cleaning method for Racetech seat upholstery? Apart from our (discontinued) 9100 Sprintcar seat models, it isn’t recommended that you remove the seat cover for cleaning. The cover is glued down and not designed for removal. With the seat cover still in place you can use a combination of mild detergent/soap and water to remove dirt and dust. Use water sparingly, as excessive water will soak through the seat fabric into the foam and extend drying time. Do you sell sliding seat rails? At this stage, we don’t. Our goal is to produce advanced motorsport seats for serious competitors. In a high speed side or oblique impact, the loads on the seat mounting brackets/rails are very high. Many sliding rails available are not designed to handle these loads and may deform or break, increasing your chances of injury during an accident. I’m finding it difficult to know if your seat will fit in my car. Can you help? If you have already checked out our dimensions tables, but need more specifics, we can supply CAD models for our 119 and 129 series seats. Please contact us directly with your request. CAD model requests are strictly considered and you will be required to sign a non-disclosure agreement. Can you help me compare seat models so I can make the right decision? 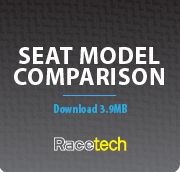 Check out our Seat Comparison PDF which you can download here. You can also compare the specifications of up to four seat models (or our other products) by clicking the ‘Add to Compare’ button on each product page. In what currency are the prices displayed on your website? On our EU/UK site, www.racetecheurope.co.uk prices are displayed in Pounds Sterling (GBP) and exclude taxes except where otherwise specified. For retail customers, VAT is calculated and added to your order total at the shopping cart stage. We accept Visa and Mastercard payments online using Realex secure payments. We also accept PayPal and bank deposits. If you wish to collect a purchase from our warehouse in Tamworth, Staffordshire, you are welcome to pay by credit card or with cash. Is the listed seat price for one seat or a pair? The seat prices listed on our website and in all other media (unless otherwise specified) are always for one seat only. Yes, Racetech products can be sold internationally. In the first instance, please contact our distributor(s) in your location via the contact form. If there is no distributor in your part of the world, please contact us for further information and shipping rates. I love your product, can I become a dealer or distributor? Yes, please view our Dealer page here for an application form. If you wish to apply as a distributor for your country, please email Racetech NZ directly using the contact form.